Subterranean termites nest in the ground and infest wood directly in contact with the soil or by construction of mud tubes within which they travel to and from their nest. Though termites consume wood, they are unable to digest it but instead possess one-celled protozoa in their gut that breaks down the wood cellulose into a form that the termite can then consume. Subterranean termites are social insects (much as honeybees, carpenter ants, and yellow jackets are social insects). Four ‘castes’ make up the framework of the colony: Primary and secondary reproductives, soldiers, and workers. In large colonies, the secondary reproductives produce the greatest share of offspring. Soldiers have large heads and mandibles; their sole purpose is to defend the nest from invaders. The workers, a cream-colored wingless creature, provide the food for the nest. 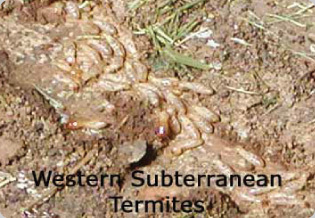 The species of primary economic importance in the Pacific Northwest is the Western subterranean termite (Reticulitermes hesperus), which is found from south-central British Columbia to northern Mexico. The workers and soldiers tend to be about 3/8 inch long; the winged reproductives are black and about ½ inch long excluding wings. Reproductives typically swarm in western Oregon either in the spring or early fall, depending on the individual colony. Subterranean termites like moisture, but are discouraged by water saturated soil. They can travel up to 100 yards away from a nest to their food source. This often means that the point of infestation where termites are found in a structure does not necessarily indicate that the nest is in close proximity. Colony sizes can exceed 60,000 in number. 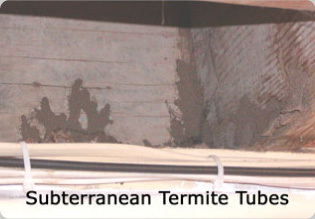 The most common sources where Western subterranean termites are found include earth-wood contact outside and under a structure, wood debris and form boards left under a structure, damp or poorly ventil ated areas, cracks in continuous concrete foundations and slabs, and concrete slab locations where a heat source (furnace, hot water heater, or appliance) is in place. Additional academic information regarding termites in the Pacific Northwest can be read by clicking here. Corrective measures: Eliminating moisture problems, eliminating earth-wood contact, and form board/wood debris removal are all vital. Because colony locations generally cannot be determined with certainty, products registered by the EPA (U.S. Environmental Protection Agency) for termite control are generally applied to the soil either along the foundation, substructure pier pads, and/or under concrete slabs to create a barrier that termites cannot cross. Localized infestations may be controlled with other methods that are also effective. Leupitz Pest Control is one of Oregon’s most experienced providers of termite control services and can provide solutions to fit your specific needs.